Feature Availability: The Enhanced Platform Installer (EPI) is currently in a pilot release status. At this stage, it is available only to customers that are part of the EPI pilot program. EPI increases the speed and simplicity of installing and upgrading SentryOne implementations. It allows the automation of upgrades and deployments of the SentryOne platform with a command line interface experience. EPI minimizes the downtime required to update the monitoring solution by removing the need to manually shut down monitoring services or close client connections. Example of the SentryOne Installer Command Line Interface. Command Prompt must be "Run as administrator" for all commands. This means that --connectionserver will not work for --connectionServer. The instructions include commands with placeholders for parameters specific to your SentryOne environment. This section describes all of the parameters used in the EPI instructions. <connectionName> The friendly name for this connection which appears on the Repository Connection Management screen. This is labeled with a "1" in the image below, which has "VM-SENTRYONE-DB.Sentr..." displayed as its truncated value. The name itself is arbitrary, but once you pick one, you must stick with it for all EPI commands associated with this connection. <serverName> The name of the server hosting the SentryOne database or where you will install the SentryOne database. This is labeled with a "2" in the image above, which has "VM-SENTRYONE-DB" as the value. You may use "localhost", if applicable. Note: In many cases, the value of this database name will simply be "SentryOne". <SQLServerUserName> The SQL Server authentication user name. Note: This is only needed when using SQL Server authentication. <SQLServerUserPassword> The SQL Server authentication password associated with the SQL Server user name. <SQLServerConnectionPort> The SQL Server connection port. The default port is 1433. Note: This is only needed when specifying a different parameter value for the port number. See the Connecting article for more information about the SQL Server Connection Port. <serviceAccount> The account used to run the SentryOne monitoring service. The following command is equivalent to completing the Service Account Information screen as shown below. See the Monitoring Service Security article for additional information on service account requirements. <servicePassword> The password associated with the service account. The servicePassword will be masked in the command line interface. How does using the SentryOne installer impact the SentryOne client during an upgrade? If a SentryOne user has the SentryOne client open, they receive an alert informing them that the SentryOne client must be shut down due to an upgrade. It will ask them to exit the application and display a "shutdown countdown" starting at 120 seconds. How does using the SentryOne installer impact the SentryOne client after an upgrade? When the SentryOne client is launched after an upgrade, a message appears, indicating to the user that the client is checking for updates and asks them to wait while the client is updated. 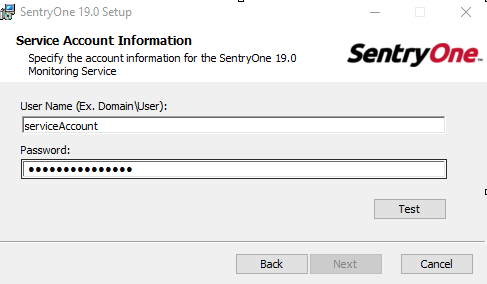 Complete the following steps to install SentryOne for the first time. There should be no existing SentryOne components on the machines where you complete this install. This process walks you through creating the SentryOne database, installing the monitoring service, and launching the client. 1. Double-click SentryOneSetup.exe. The files are unpacked to C:\Program Files\SentryOne Framework. Note: Packages are written to the tables during this step. Note: The SentryOne monitoring service is now installed and running. 7. Launch the SentryOne client. You will see a loading dialog as files are downloaded from the SentryOne database for the latest version of the client. It may take a few minutes for the files to download. Success: SentryOne is installed and ready to use. Continue to the Onboarding article for additional assistance. In many cases, a SentryOne installation uses multiple monitoring services for load balancing and monitoring an increased number of targets. See the Installation Recommendations article for advice on the recommended number of monitoring services. Success: The SentryOne monitoring service is now installed and running. Warning: There are two different upgrade paths. One path is used if your installation was performed using EPI, and the other is for an installation that did not use EPI. If you used EPI for the installation or previous upgrade, follow the first set of instructions for Existing EPI Upgrade. If your installation or previous upgrade did not use EPI, following the second set of instructions for First EPI Upgrade. Use this option if EPI was used for the initial installation or previous upgrade. 6. Wait for the upgrade to complete. Note: The upgrade command sets the desired version, and the SentryOne monitoring service is updated to the current version. There is not status indicator. Success: The SentryOne installation has been upgraded and is now ready for use. Use this option if EPI was not used for the initial installation or previous upgrade. 1. Uninstall all current SentryOne monitoring services using Add/Remove Programs. 2. Ensure all SentryOne clients are closed (disconnected from the SentryOne database). Note: The files are unpacked to C:\Program Files\SentryOne Framework. 9. Launch the SentryOne client. You will see a loading dialog as files are downloaded from the SentryOne database for the latest version of the client. It may take a few minutes for the files to download. Success: The SentryOne installation has been upgraded and is now ready for use. The next time you need to upgrade, use Option 1 for an Existing EPI Upgrade. listpackage Lists all packages in the SentryOne database. push Pushes an upgrade package into the SentryOne database. addreg Adds a connection registration. removereg Removes a connection registration. removeregall Removes all connection registrations. updatereg Updates a connection registration. listreg Lists existing connection registrations. install Installs the SentryOne controller software. uninstall Uninstalls the SentryOne controller software. start Starts the SentryOne controller. stop Stops the SentryOne controller. uninstallms Uninstalls a SentryOne monitoring service. startms Starts a SentryOne monitoring service. stopms Stops a SentryOne monitoring service. createdb Creates a SentryOne database. upgradedb Upgrades a SentryOne database. upgrade Marks a SentryOne version to upgrade to. help Displays more information on a specific command. By default, telemetry is disabled after completing an initial installation using EPI. If you would like to enable it or learn more about telemetry in SentryOne, see the Telemetry article. Problem: The upgrade process is being blocked. If this is for the first option, where EPI already exists, it's possible that SentryOne components were installed before using the EPI. For example, there may be clients connected to the SentryOne database that were installed pre-EPI. In this scenario, there are no bootstrappers running to manage those client processes, which means that the so upgrade command cannot control those pre-EPI clients. The pre-EPI clients will continue sending a heartbeat to the SentryOne, and the upgrade will be blocked until the clients are shut down.